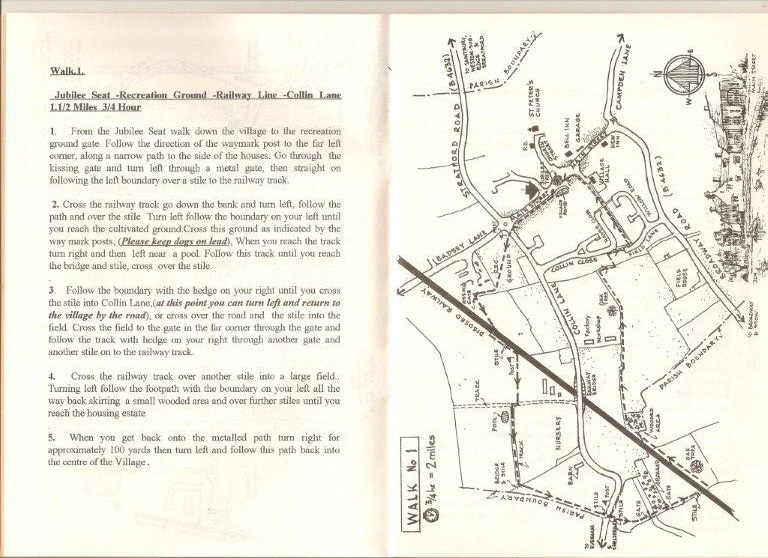 How to get to ( and leave from ) Willersey Village. Willersey is about 1.7 miles from Broadway depending on your route. You can walk along the Broadway and Leamington Roads or there are about three different footpath routes which make for more pleasant walking. 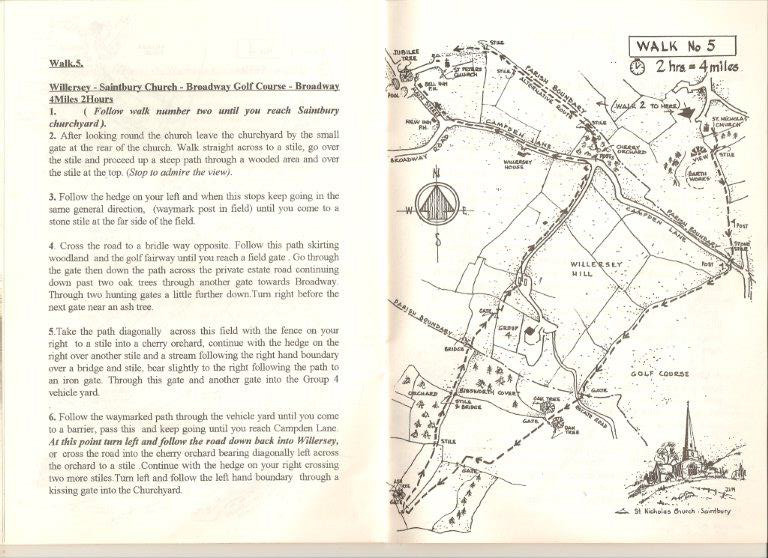 The most comprehensive map of footpaths are on Ordnance Survey map OL45 or you can buy a cheaper Complete Footpath Guide to Broadway from places such as the Tourist Office near Budgens or Broadway Tower. If you are walking your dog then this leaflet from Gloucester County Council may be useful. Footpaths in Willersey have changed little over the years other than some diversions caused by some housing developemnts. All the footpaths are now registered under the Footpaths and Countryside Act 1949. One possible route is first to take a bus to Broadway. 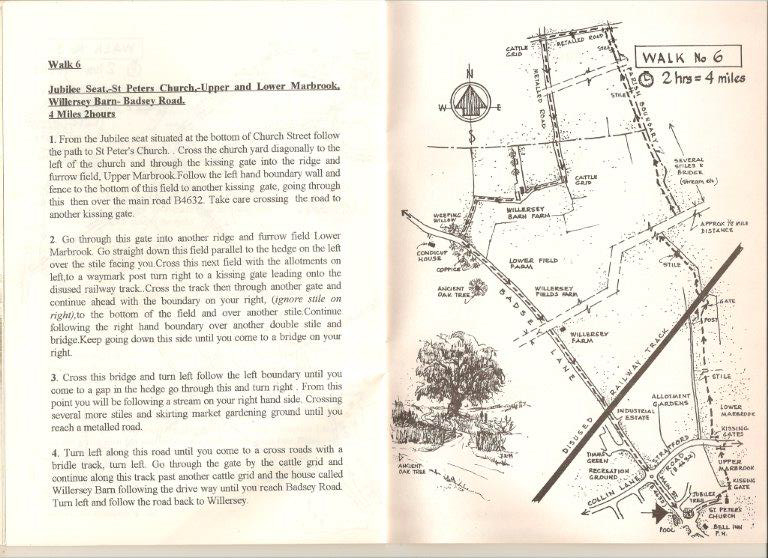 Start at the front of the Lygon Arms, turn left, head past Lloyds Pharmacy and take the path through to Budgens. Go down Gordon Close to the thatched house, turn right and go along the footpath, through the gate at the end, leftish and keep going ahead. Eventually you will pass some houses on your right. Keep straight ahead through a small wood. Go through a farm gate, past a stable on the left and cross some more fields. Follow the path through some more vegetation and go under the Broadway bypass through a tunnel. Cross another field, go over the stream bridge, turn left and just keep going. Eventually you will arrive in Collin Close. Turn right, and after 100 yards/metres turn left onto Blind Lane which brings you to Main Street by the village pond. Click on the map for more detail. Enjoy. To come back by a slightly longer different route, go up Broadway High Street and then continue past the traffic roundabout to the Upper High Street. turn left into Bibsworth Lane and take a tunnel under the bypass. You will now be on a footpath. 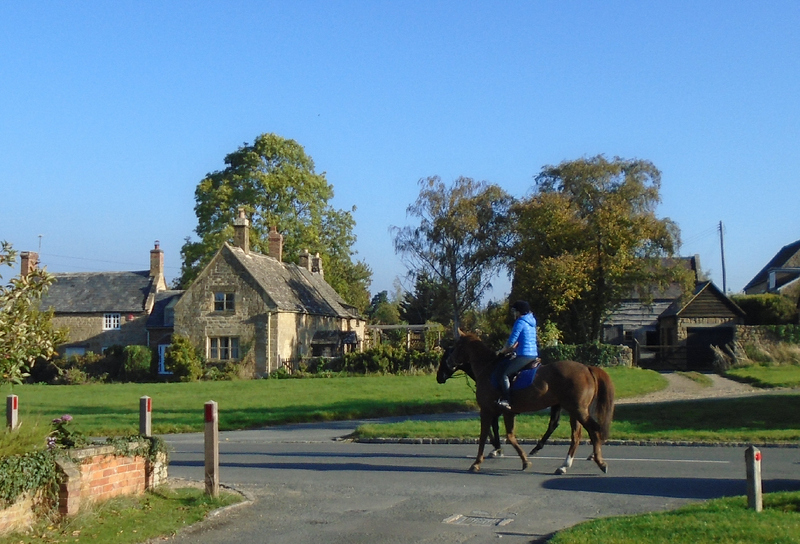 Take the left fork and keep going straight on past Foxhill Manor and the Fish Inn. You will eventually arrive at Campden Lane. 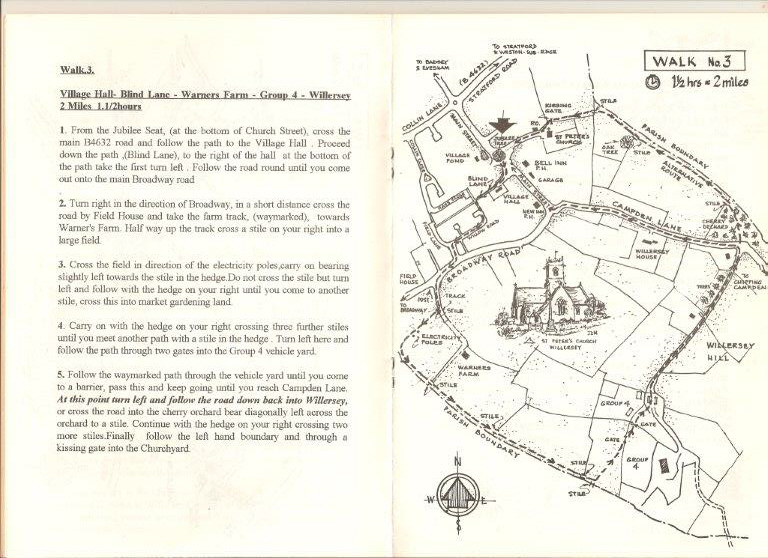 Turn left and head downhill to Willersey. An alternative walk to Broadway is the old railway track. 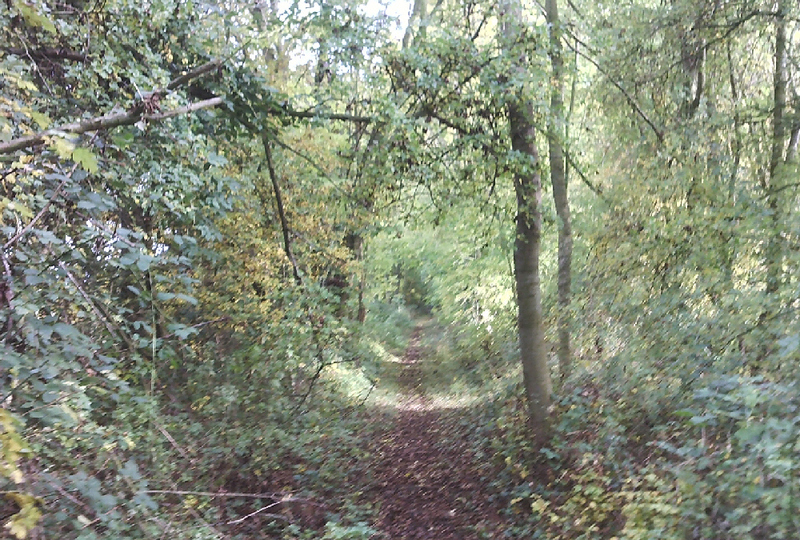 This is longer but its a good walk - maybe take some cutters if the brambles have grown! 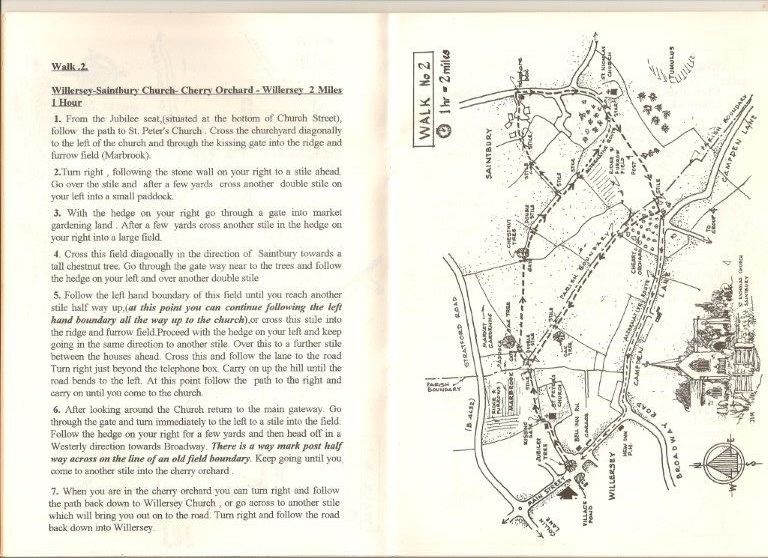 Willersey Parish Council in the past published a booklet of six walks around Willersey. Click here for scans of the booklet. Click on the map below for a larger image. 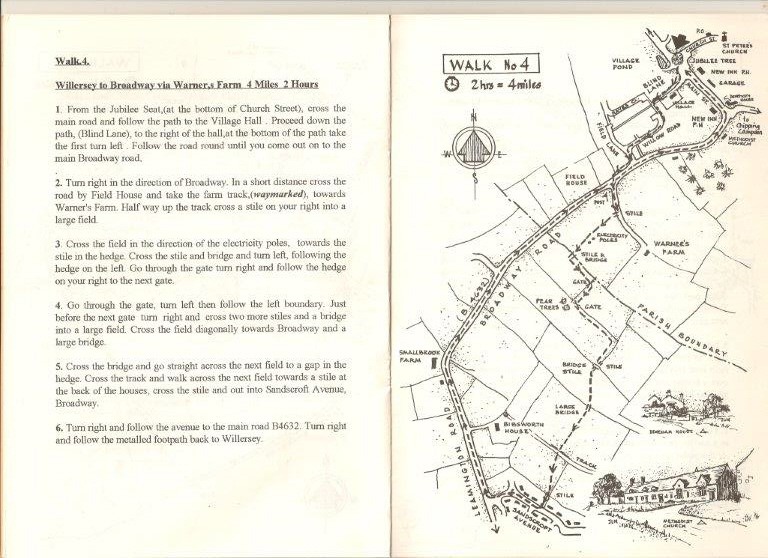 On this map Defined Footpaths in Gloucestershire are in pink and bridle paths in blue. The black line is the boundary with Worcestershire so its Defined Footpaths are on a different map. 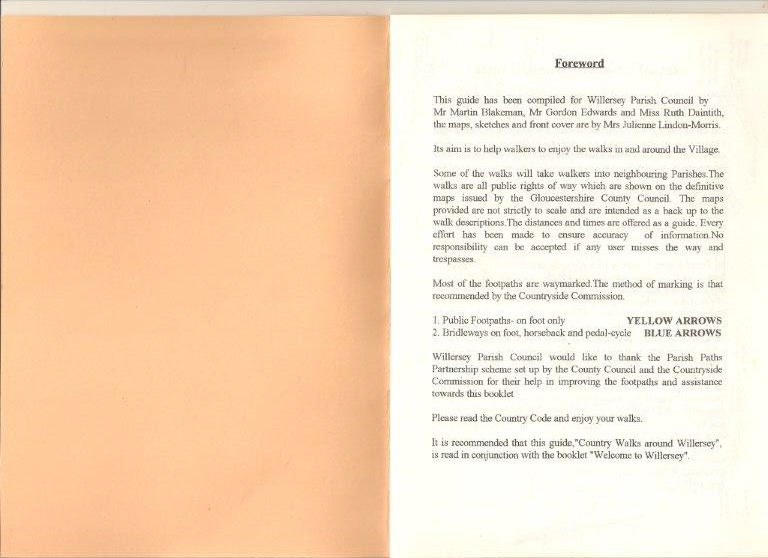 In the year 2026 unrecorded pre 1949 public rights of way will cease to exist if not specifically preserved. If you see an omission do let Willersey Parish Council know. Here is the definitve map for Worcestershire. Zoom in to see the footpaths. The shortest route is along the Leamington Road. If you are coming from the East, take care descendng Fish Hill which is steep and exhilarating but could be dangerous. There is a quieter route down Campden Lane but it is one of the steepest roads in the North Cotswolds. Riding up is a definite challenge. This is a very old road. The hard limestone of the Cotswolds wears down at a rate of 2 inches per century, thus giving this road an age of 10,000 years. The route from Evesham is much flatter and again for the quiet life use Badsey Lane rather than the A44. If you arrive in Willersey by other means you can hire electric bicycles at Willersey Stores. From Stratford-upon-Avon the B4632 road is undulating but can be busy at peak times. Currently residents and councillors report highway problems, especially potholes, to the Parish Clerk and I then report them via the link below as any member of the public can. It would cut out the middleman if everyone went direct, especially as the website allows complainants to pinpoint the problem on a map instead of giving the clerk vague directions. The clerk is happy to chase up problems if they have not been addressed but if it would help if he can reference a complaint. Fortunately Willersey is a unique village/town name worldwide so there will be no confusion about where you are driving to. Willersey has an astonishing twenty three post codes but WR12 7PJ is the largest and the most central so it is probably the best one to put into any sat nav. Here is a full list of the other postcodes in Willersey. These postcodes give the impression that Willersey is in Worcestershire, not Gloucestershire, but these are for postal use only. 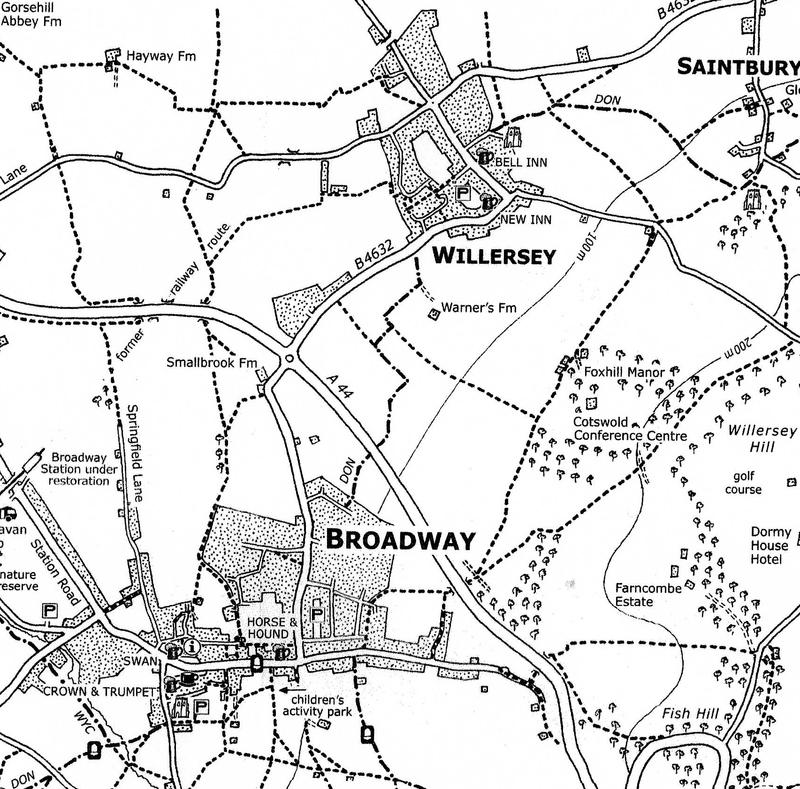 Willersey is just off the A44 where it runs from Oxford to Evesham. It is well signposted at the Evesham end of this section of the A44. in the Village car park behind the Village Hall at any time. Thre is also a car park at the end of Church Lane for those who are visiting the Church. We live in Gloucestershire but are very close to Worcestershire. Roadworks and road closures by both counties can affect us. Each county has a different way of putting these on the web. Gloucestershire publishes a list sorted by village name. Willersey is near the end. Worcestershire publishes an interactive map, Click on the insignificant plus sign at the bottom right hand side to zoom in, to see the detail. You can drag this map to the area you want to see. When driving from the Broadway direction to Willersey there is a very sharp left hand bend opposite the Methodist Church. If you wish to turn right up Campden Lane at this point, because of poor visibility it may be better to go down Main Street, turn round and approach the junction from a safer, different direction. Campden Lane is one of the steepest roads in the area and in cold weather can be very icy - particularly as a stream flows for a short way down it. Gloucester Highways are going to erect two hinged signs that have the snow flake symbol on Campden Lane along with a plate saying that the road is Liable to Ice. One of their gangs with a JCB recently - December 2017 - went up the hill, removed ice and shovelled out the channel. A temporary A3 laminated sheet has been tied to the back of a Give Way sign that says ICE. Again in March 2018, Campden Lane was treacherous. Look at the weather and just avoid it. This road was closed from the 11th June 2018 to 22nd June 2018, to allow contractors, working on behalf of Western Power Distribution, to carry out the installation of a new mains power cable. Please see the blue mark on the map below. If you required any further information regarding this closure, you could have telephoned 08000 514514. Willersey is fortunate as it has three bus routes going through it. One bus route starts in Willersey - the R4 to Evesham telephone 01386 48655. Another bus the Route 1 passes through Willersey as it goes between Moreton-in-Marsh and Stratford-upon-Avon. Click here is the latest Route 1 and Route 2 timetable telephone 01564 797000. The last route, the 606 goes between Chipping Campden and Cheltenham so when catching it you have the advantage of a waiting bus to sit in at the Cheltenham end. For light shopping it is convenient as you arrive right in the centre of Cheltenham and have no traffic hassle or parking charges. If you have a bus pass you even save the £5.50 day explorer fare. Here is the timetable for route 606 and Marchants telephone number is 01242 257 714. As three bus routes go between Broadway and Willersey - the 1, R4 and 606 on a weekday there are 13 buses a day at the moment between the two towns. If the buses are not used sufficiently there is always a chance they may be withdrawn as has happened to the buses about 7:00am in the morning. Do use them if you have no compelling reason to take a car. Subsidy to buses is vulnerable to cuts as councils do not have a duty in law to support them as they do for say education, social care and road maintenance. A successful bus market can cut congestion, reduce social isolation, help the environment and offer a variety of economic benefits. On Tuesdays the Hedgehog Community bus route H3 passes through Willersey to Stratford-upon-Avon. If you have any queries about this then please telephone 01386 701666. They have their latest timetables on their website. You can also hire Hedgehog Buses privately. in the UK. Every station, coach terminus, airport, bus stop, etc., is allocated at least one unique identifier. In Willersey we have three bus stops and each is given two identifiers according to the direction of travel of the buses. What use are these identifiers? Well you can verify that you are standing at the correct stop as it should be on display. You can text it to 84268 to find the next bus times according to the timetable - eventually these will be in real time. Finally you can also type the ID here for comprehensive timetable information. of a bus pass on some buses. Its identifier is wocdpagd. The bustimes website has photographs of most of the bus stops in the country. Here they are for Willersey. If you are a visitor then this can be a useful website. To apply for a bus pass go here. To change an address on a bus pass, normally you take along proof of your new address (which can be a driving licence, passport, utility bill, or council tax bill) to a local participating library. This includes the main libraries at Gloucester, Cheltenham, Tewkesbury, Cirencester, Newent, Cinderford, and Lydney. On some occasions, you can change an address by a letter or email. This email or letter would need to include your previous and current addresses and postcodes along with your full name. These participating libraries are also where applications for an age-related bus pass can be made by those who are not computer literate with the help of library staff. This includes the facility to take photos for the bus passes and help with all parts of the application. (Staff at these libraries can also replace lost bus passes for a fee of £5 for those who do not want to use the online replacement portal. The full list of participating libraries can be found here. 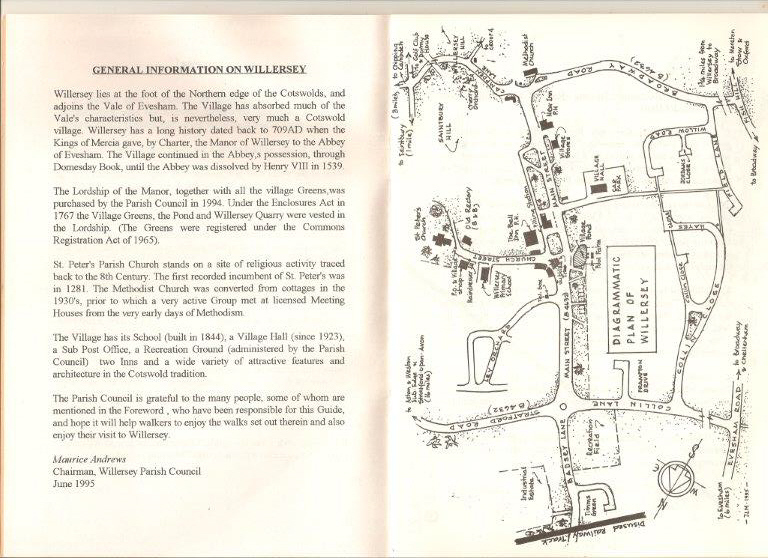 The closest of these to Willersey is Chipping Campden but Winchcombe Library may be more convenient as its on a bus route! Provide transport for people who need to meet appointments, have no transport of their own and are unable to use public transport. The volunteers charge 50p per mile. Contact details are here. Here are contact details for local taxi companies in increasing distance order from Willersey. The nearest train station is 3.4 miles away in Honeybourne. From here trains run directly to London Paddington via Oxford, Reading and Slough. National Rail Enquiries or telephone 03457 48 49 50 will help you plan any journey. The trains heading out of London go to Evesham, Malvern, Ledbury and Hereford. You cannot buy tickets at Honeybourne Station so if you do not have a ticket, it is best once on the train, to fairly soon find the guard, and buy one. If you do go to Evesham to buy tickets, then its best to avoid the rush and go after 9.15am. If you cannot drive or find a lift, getting to and from Honeybourne Station is not totally easy. You could take a taxi, or walk along Buckle Street and dodge the traffic. There are footpaths across fields away from the traffic or you could cycle. There are a few buses each day but they go to Evesham and from there you would need to take another bus to Willersey - it would be better to stay on the train to Evesham and then take the R4 bus! 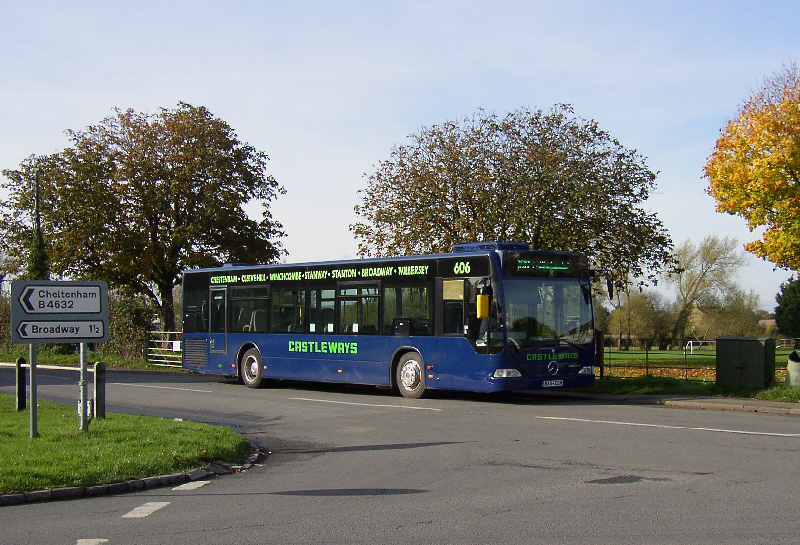 Other stations on bus routes connecting to Willersey are Moreton-in-Marsh, Cheltenham and Stratford-upon-Avon. 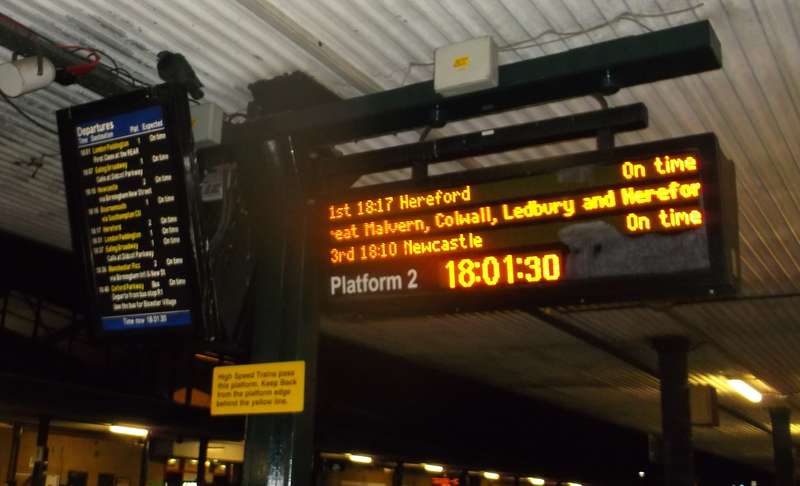 You can view the live departure board at most stations like this one at Moreton in Marsh. The details link will tell you where that particular train is in real time. The car park at Honeybourne Station is (unusually) currently free and there are stands to padlock your cycle. Here is a map of the train services in our area. Honeybourne is approximately at the top of the map in the middle. This zoomable map has every station in the country but it is very detailed. If you are travelling to London, the cheapest best value ticket is usually a cheap day return but some advance tickets can be cheaper. They are published up to 3 months ahead. It helps to buy a discount card if you are eliglble for one. Split ticketing surprisingly may also work out cheaper. Rail ticket prices in the UK are some of the most expensive in Europe. Crazily for some journeys it can be cheaper to fly out of the UK to a foreign airport and then back to your destination! The line between Charlbury and Evesham had been reduced to single track but most was redoubled in August 2011 because of increased customer demand. The plans to build a new Worcestershire Parkway Regional Interchange station near to Norton to cope with further expected increased customer demand have been approved. The new station should be complete by 2019. This in turn will lead to the Cotswold line between London Paddington and Worcester being doubled all the way. The Cotswold Line Promotion Group keeps up with the latest developments. The Stratford Worcester Oxford (SWO) group are calling for the line from Honeybourne to Stratford to be reinstated with a a station at Long Marston. Developer CALA Homes, building 3,000 houses in Long Martson would provide £17m of the £60m needed. Travel time to Birmingham from Evesham would be cut from two hours to 58 minutes. Evesham and other local villages would benefit from such a new route. If for any reason there are major problems on the Moreton Line, then a possible alternative is to drive to Banbury and take the train from there. Another option is to drive to Water Eaton Park-and-Ride north of Oxford and from there take a Chiltern Railways train to London Marylebone from Oxford Parkway Railway station. If more than two of you are travelling to London together, or you want to arrive at an anti-social time, then consider driving to the Thornhill Park and Ride in Oxford and taking the Oxford Tube coach. If you wish to drive further, then Hillingdon station on the London Underground can be a good choice. The Gloucestershire Warwickshire Railway, a heritage steam line, is now in 2018 extended to Broadway. 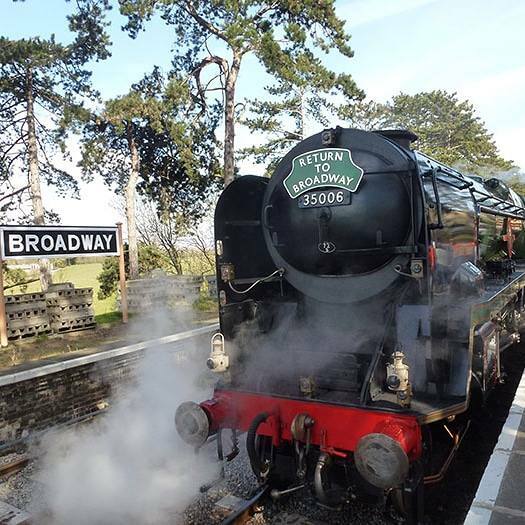 After 58 years train services again run to Broadway Station! You can now travel over 14 miles from the historic village of Broadway all the way to the Race Course Station in the town of Cheltenham. 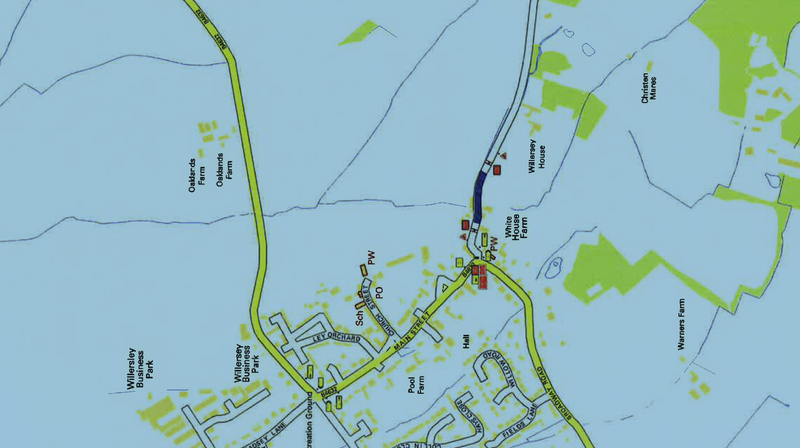 A possible further future extension to Honeybourne will follow the original route and pass near to Willersey. There are also plans to open the line from Honeybourne to Stratford in the future. Indicator boards are not necessarily accurate! it does not carry the flight volume of the other two airports. A new railway station is currently under construction there. Gatwick Airport is easily reached by train from Honeybourne and other local stations by taking a train towards London and changing at Reading. Heathrow Airport requires two changes, one at Slough and another at Hayes & Harlington. For Stansted Airport take a train to London Paddington, tube to Liverpool Street and then an overground train to Stansted Airport station. Birmingham Airport, Birmingham International Railway station and the National Exhibition Centre are all next door to each other on the same site. A covered walkway and an automatic Skyrail shuttle link them all together. Birmingham Airport now has a free 30 minute drop off and pick up zone. You can pay for a premium drop off service. You can also take your travellers to the railway station and they can use the free automatic Skyrail which operates every two minutes daily between 05:15 and 02:00. If you are collecting someone, then there is a free short term car park for up to 20 minutes on the right hand side beyond the railway station entrance. Here is a complete Guide to Birmingham Airport. If you really do not want to fly then the man in seat 61 can help you travel to most of the world.
. Map of Willersey and surrounding villages. 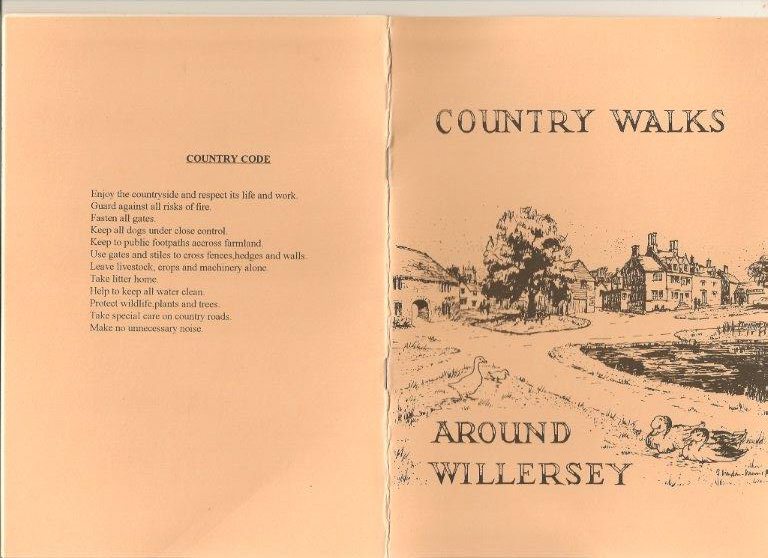 Willersey Parish Council in the past published a booklet of six walks around Willersey. Below are scans of the booklet. Click on the images to make them larger. 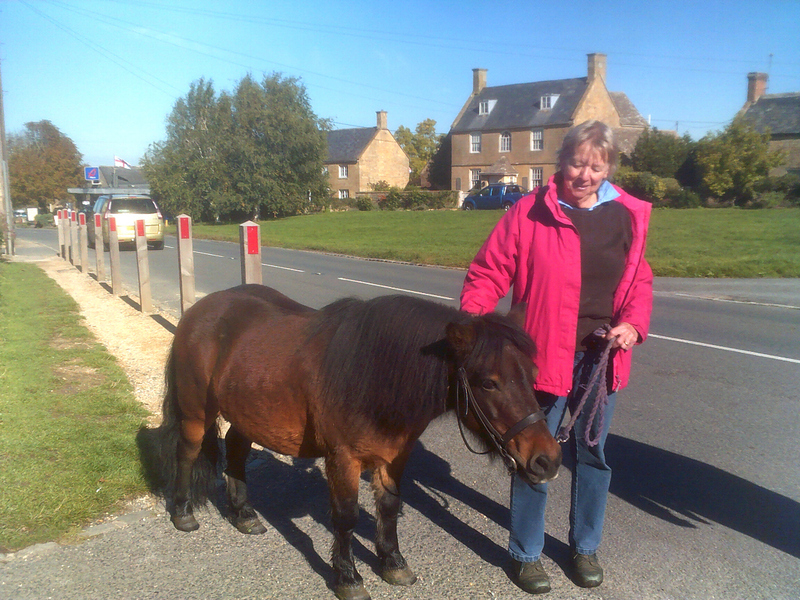 Here is a more traditional form of transport in Willersey. Bidford-on-Avon bridge is now open. The bridge in Bidford-0n-Avon on the B4085, the Honeybourne Road reopened on November 3rd 2015 after being closed from June 10th 2015. Severe damage caused by a tractor and crop sprayer caused it closure. 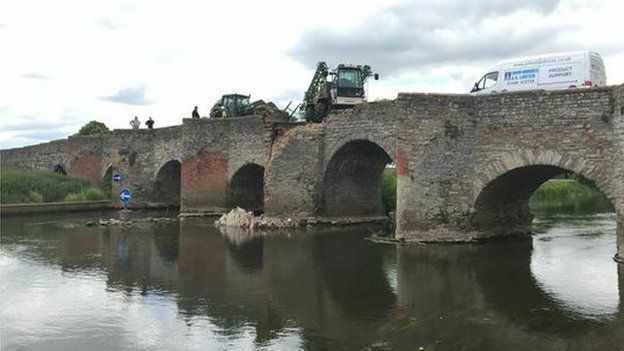 The crop sprayer hit the side of the medieval bridge causing part of it to crumble into the River Avon. The bridge remained closed for six months after the farm vehicle crashed into it. Diversions were put in place for traffic and bus services altered their routes though the bridge did remain open to pedestrians and cyclists. Its closure meant a ten mile detour. Although traditionally repaired the new masonry is easy to see as it is brighter than the original. Here is the official news.